I just found out that Kindle versions of [New Life+] Young Again in Another World aren't available anymore on Amazon.com. Can't find them on this site either. I am (partially) aware of the reasons. What will happen now? 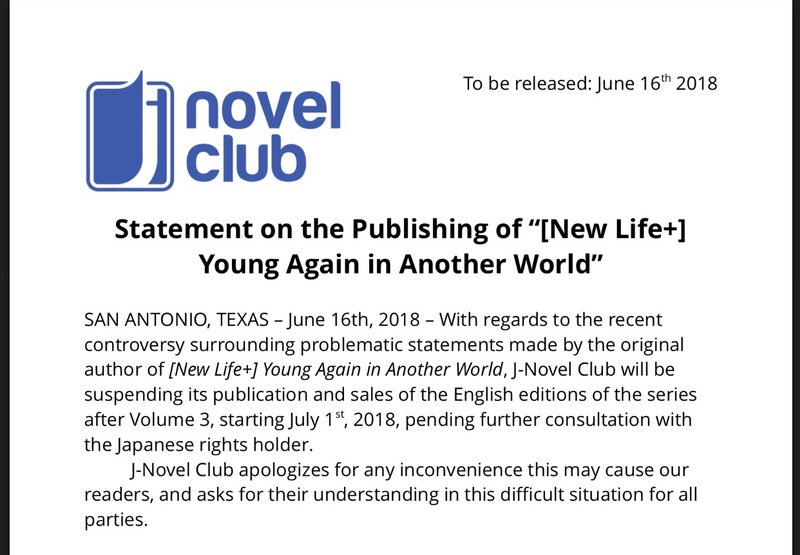 If J-Novel Club can't get author's works from Hobby Japan anymore, will JNC go straight to author himself? Or does third volume mark end for English translations? @matti please refer to this topic for all information regarding what occurred with New Life +. I did. Not all of it though. @matti In that case it will just be a wait and see thing. No circumnavigating the publisher or anything, if they decide to bring it back it happens but nothing else for now. It's too bad that this promising story has come to such an abrupt halt. Hopefully, the issues can be worked out and the series will resume at some point. If you're desperate for more story, the translation of the web novel was resumed after JNC suspended the series. Of course, the web novel itself was put on hiatus in May, though it wasn't removed from Syosetu as the author originally planned. it wasn't removed from Syosetu as the author originally planned. He never had. He just said he'll remove the problematic part and did so right away. Thanks for info! I'll look it up after I'm done with Gunota. That is a good one too (translation seems approximate though), and unlike Renya, protagonist actually has an interest for relationships and embraces his harem (or at least the #1 girl). Look it up.